We discussed many times privacy risks related to IoT devices, here we are to discuss an alarming case, fitness tracker Strava revealed details of Military Bases. American and allied military worldwide have publicly shared their exercise routes online revealing the fitness sessions conducted inside or near military bases, including Afghanistan, Iraq, and Syria. This leak of information has happened because military personnel turned on their fitness Strava tracker while making exercises at the bases. 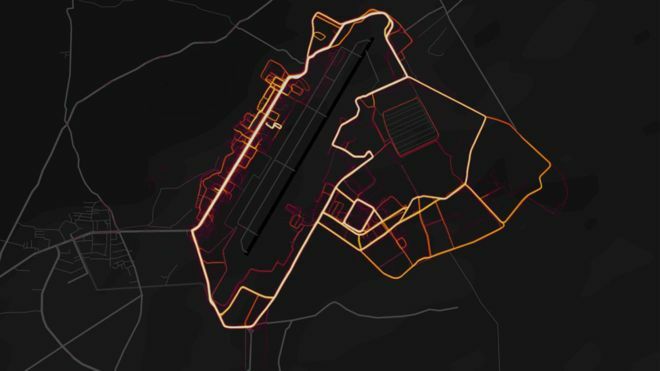 A map showing exercise routes recorded by users of a tracking app reveals sensitive information about military personnel in locations around the world, including Afghanistan, Iraq, and Syria. Such kind of information could be used by enemies and terrorists to plan an attack. Obviously while in some regions of the globe it is impossible to distinguish the activity of the military personnel, in other locations the routes immediately stand out. For example, examining the map of Iraq you can notice that the entire region is dark, except for a series of well-known military bases used by the American military and its allies. The list of the bases easy to locate thank to the map associated to the fitness tracker Strava includes Taji north of Baghdad, Qayyarah south of Mosul, Speicher near Tikrit and Al-Asad in Anbar Province and a number of minor sites highlighted in northern and western Iraq. Searching for bases in Afghanistan, it is easy to locate the Bagram Air Field in the north of Kabul along with other smaller sites south of the country. Similarly, in Syria it is Qamishli in the northwest, a stronghold of US-allied Kurdish forces, is clearly visible. Tobias Schneider, one of the security experts that discovered the map, shared details about the bases on Twitter, including the French Madama base in Niger. The researchers Nathan Ruser spotted also activities of Russians in Khmeimim. The app allows users to set up “privacy zones,” that are areas where the Strava tracker doesn’t collect GPS info. These areas can be designed around the user’s home or work, but evidently, the military personnel ignored it.